The M1 Garand rifle fires the Cartridge, Ball, Caliber .30 M2, known to civilians as the .30-06 Springfield cartridge. It's based on the .30-caliber cartridge standardized in 1906 at the Springfield Armory. The 1906 Springfield design represented a number of major trends developments in cartridge and weapon design in that era. A version of it was the U.S. military's main rifle cartridge until the M14 rifle and its 7.62x51mm NATO round was introduced in 1957. Smokeless powder had replaced black powder in the 1880s. It provided about three times the energy of an equal mass of black powder. That led to higher muzzle velocity, giving a flatter trajectory, greater accuracy, and greater range along with greater kinetic energy. Surprisingly, it wasn't until 1898 that the French came up with another new development, one that seems obvious in hindsight. 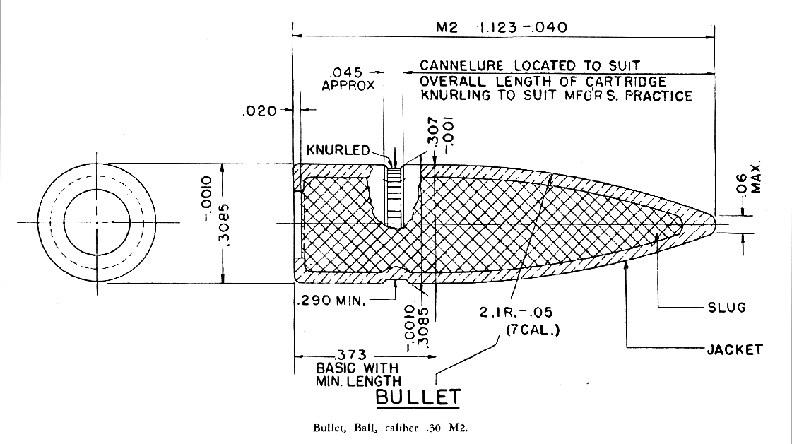 Pointed bullets provided better aerodynamics and ballistics. Those developments required corresponding improvements in metallurgy. The greater power of smokeless powder required strong receivers and barrels. It also required that the bullet's jacket and its binding to the lead core could withstand the rapid acceleration through the rifled barrel. And finally, semi-automatic operation required that the brass ammunition cases first withstand increased chamber pressure and then by yanked from the chamber by the extractor and knocked to the side by the ejector. The U.S. military went through a series of rifle ammunition designs in the few years around 1900 — U.S. .30-03, 6mm Lee Navy, and .30-40 Krag. The 1906 Springfield design then worked well for 50 years of military service. 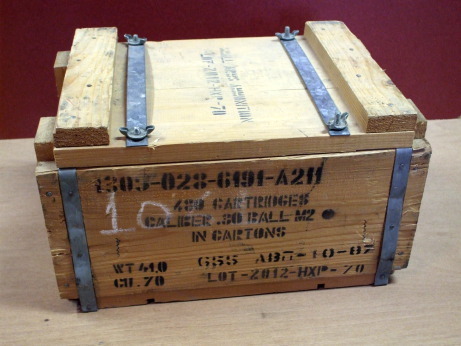 Wooden case containing 480 rounds of M2 Ball .30-06 ammunition. The Office of the Director of the Civilian Marksmanship Program (ODCMP) sells ammunition at Camp Perry, Ohio. If you happen to be close enough to there, you can buy it there. They sell M2 Ball .30-06, the standard military issue ammunition for the M1 Garand. There's a good chance that it will be Greek, as this case is. It's not terribly obvious, but see the lot marking LOT-***-HXP-**, where HXP is the headstamp code for the Greek Powder and Cartridge Company of Athens. Be very careful to avoid dangerous reloads! The CMP forum and other mailing lists have archived many horror stories that started with someone using dubious reloaded ammunition, even reloads purchased from a store. For example, here and here. The ODCMP sales offer real M2 Ball .30-06 made to military specifications. Is it absolutely guaranteed to be perfect? No. But at least it's not some unknown reloads being offered very cheaply at a gun shop. Also remember that the M1 Garand sights are calibrated for the ballistics of the standard M2 Ball round. You can get it by the case, as seen above. A case of 480 rounds, contained in two 240-round cans. 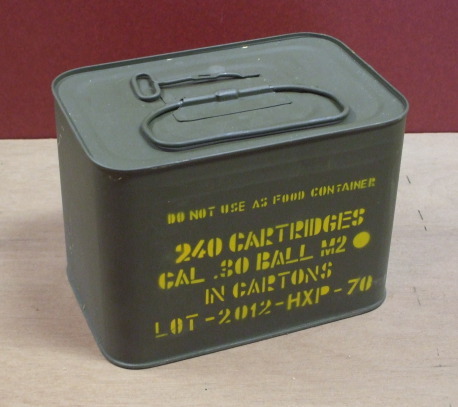 Can containing 240 rounds of M2 Ball .30-06 ammunition. That isn't really as much as it sounds like — consider that you will be shooting at least 10 rounds at each target, and do the math to estimate how long it will last. You open the wooden crate to find two sealed metal cans. Make sure to wear leather gloves while struggling to open the cans! It's fairly easy to open the cans using the attached key. But it's quite difficult to avoid some jagged metal edges while doing so. This can is also marked with a lot number including the manufacturer code HXP. I would guess "H" for "Hellas", that being Greek for "Greece". But that's just a guess. You will need some en bloc clips to use an M1 Garand. You can purchase them directly from a manufacturer, as seen above. Another way to get them is to buy some of your ammunition in bandoliers. The bandoliers are made from very non-sturdy green cotton. Each bandolier has six pockets holding eight rounds each. The spring steel en bloc clips hold eight rounds each. A cardboard wrapper is intended to keep them from tearing right through the flimsy cotton bandolier. Depending on what you bought, the ammunition might be in cardboard cartons, as contained within the metal can above. Bandolier holding six en bloc 8-round clips of .30-06 ammunition. 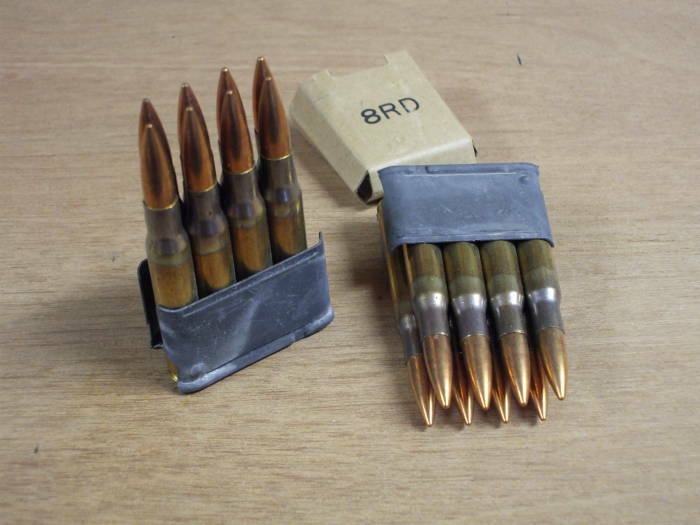 Closer view of two 8-round en bloc clips of .30-06 ammunition. The CMP imposed a purchasing limit of 10 cans per year in April 2009. 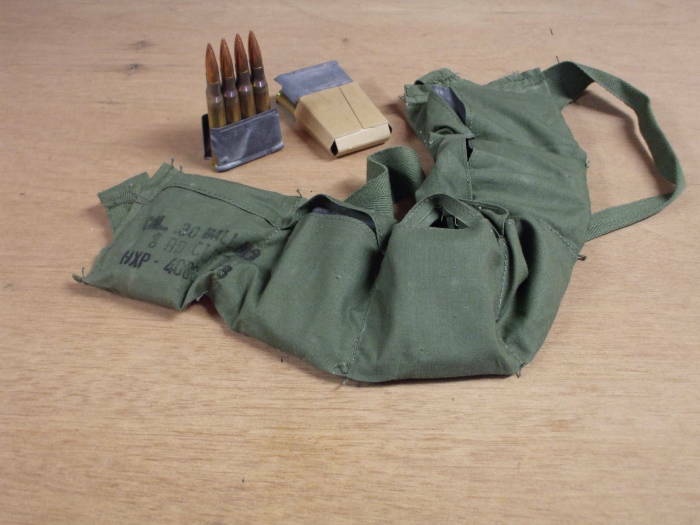 For the 407-CAN item of .30-06 ammunition in 8-round enbloc clips in bandoliers, as seen here, that's 192 rounds per can, and so 1,920 rounds per year. Why? The month before that, a friend of mine was at the Camp Perry sales facility and saw two guys who had shown up in a pickup truck two days in a row, each day buying as much .30-06 ammunition as they could fit into the truck. They were packing in more ammunition than they could safely transport, as they stacked the truck bed with ammunition crates until there was no more room and the springs were completely compressed. The greed and fear of a few ruined things for everyone. Well, maybe not ruined exactly, but certainly inconvenienced. Things are a bit different these days, though. These days owning and shooting an M1 virtually requires that the owner / shooter be a handloader as well. The seemingly limitless quantities of surplus .30-'06 ammunition of the 1950s and '60s were limited. Whether drawn from DCM stock, or purchased for only pennies per round, that ammunition has largely disappeared — most of it downrange — leaving only the brass cases. And, those cases, their reuse for more shooting and more fun, is what concerns us here. .30 Caliber M2 Specifications from "Hatcher's Notebook"
The following are from pages 35-37 of "Hatcher's Notebook", by Julian S Hatcher, Major General, U.S. Army, retired, The Telegraph Press, 1947. Notice that the .30 Caliber M2 Ball round as standardized by the U.S. military is not the same as the .30-06 Springfield round. They are very similar, but not exactly the same thing. I think it would be accurate to say that .30-06 Springfield is a more general category, and the .30 Caliber M2 Ball is one more specific specification. "Hatcher's Notebook" includes ballistic tables showing slight differences between generic Springfield .30-06 and the M2 and armor-piercing M2. One of those tables is reproduced in the next section. Page 35: Cartridge, Ball, cal .30 M2 (Gilded) and M2 alternative (Steel Socketed). 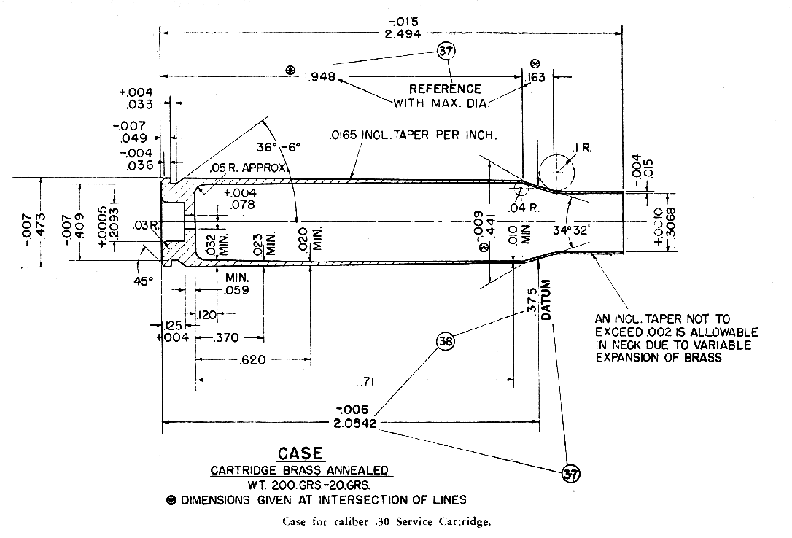 Page 36: Case for caliber .30 Service Cartridge. Page 37: Bullet, Ball, caliber .30 M2.